Thirty years after the founding of the Song dynasty (宋朝 960-1279), the government was still struggling to consolidate rule. Economic hardship in the country was so great that peasants formed rebel armies to resist Song authority and kill corrupt officials. The largest uprising took place in Sichuan (四川). Tea farmers rose up against the government monopoly on tea purchases (博買務) which was preventing them from making a reasonable income. The tea farmers were joined by landless tenant farmers (旁戶) who were being exploited by rich landowners. By 993 AD, this insurrection had grown to include several hundred thousand peasants. Under the leadership of Wang Xiaobo (王小波), and adopting the slogan “equalize the income of the rich and poor” (均贫富), the rebel army was able to defeat regular Song armies in Sichuan. The rebels raided government granaries and redistributed grain. When Wang Xiaobo died in battle, his brother-in-law Li Shun (李顺) assumed leadership of the uprising. Military strength grew under his command and in 994 AD he attacked and successfully occupied Chengdu (成都) which was Sichuan’s largest city. Li Shun then proclaimed himself King of Da Shu (大蜀王) and adopted the period title “Ying Yun” (应运). 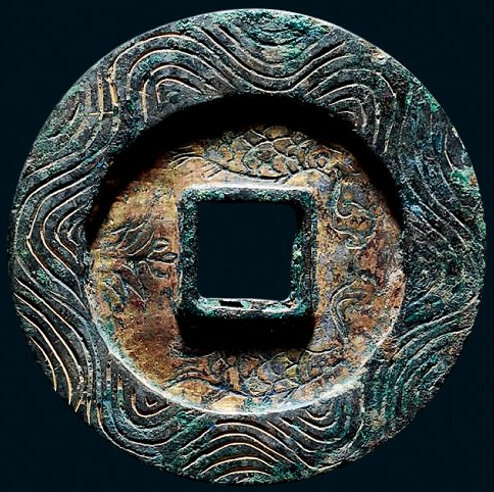 In 994, Li Shun began to cast bronze (铜钱) and iron (铁钱) coins with the inscriptions ying yun yuan bao (应运元宝) and ying yun tong bao (应运通宝). The coins are traditional cash coins with inscriptions written in clerical script (隶书) and read in a clockwise (旋读) manner. They are similar in style to the coins of the Five Dynasties and Ten Kingdoms (五代十国) and, in particular, the coins of the Former Shu (前蜀 907-925) and the Later Shu (后蜀 926-965). These were kingdoms situated in Sichuan with the capital at Chengdu. The Later Shu was conquered by the Song in 965. 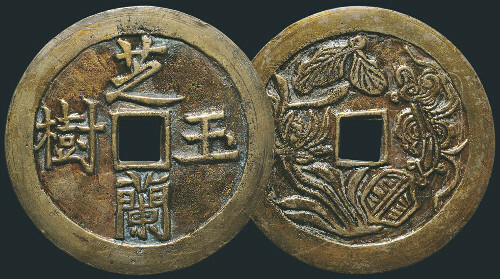 At the left is an example of a bronze ying yun yuan bao (应运元宝) coin in the collection of the Shanghai Museum (上海博物馆). The coin weighs 2.9 grams. According to one reference (中華珍泉追踪錄 p.184), this coin was donated to the Shanghai Museum by Mr. Sun Ding (孙鼎) who was a famous Chinese coin collector of the 20th century. The National Museum of China (中国国家博物馆) also has a bronze ying yun yuan bao which can be seen here. This coin has a diameter of 23 mm and a weight of 3.9 grams. In addition to the bronze ying yun yuan bao coin, the National Museum of China also also has an iron ying yun tong bao (应运通宝) coin which can be seen here. This iron coin has a diameter of 23 mm and a weight of 3.7 grams. After a very short time, Li Shun changed his reign title to Ying Gan (应感). 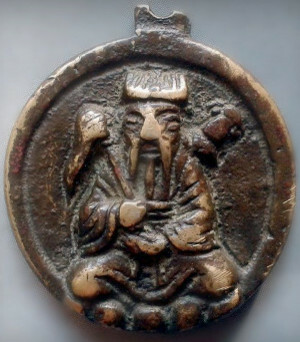 According to the Baidu Encyclopedia, after Li Shun died in battle, his subordinates began to cast bronze and iron coins with the inscription ying gan tong bao (应感通宝). Shown at the left is an outstanding example of a bronze ying gan tong bao coin. The diameter is 23.7 mm. In 2015, this coin sold at auction for about $54,000 (RMB 368,000). Another bronze ying gan tong bao coin is in the collection of the National Museum of China and can be seen here. This specimen has a diameter of 23 mm and a weight of 3.2 grams. An example of an iron ying gan tong bao coin can be seen here at the Sichuan Museum (四川博物馆). This iron coin has a diameter of 23 mm. The reverse sides of all the coins are blank with the exception of the ying yun yuan bao (应运元宝) bronze coin at the National Museum of China. According to the museum’s website, there is a “star” (星) and a “moon” (月) on the reverse side. Unfortunately, the image on the website is too dark to discern the star and moon. However, a January 29, 2016 article in the “China Shoucang Journal” (收藏) displays the image of a bronze ying yun tong bao (应运通宝) coin that was recently excavated in Hubei (湖北). As can be clearly seen, this coin has both a “star” and a “moon” (月孕星版) on the reverse side. With a diameter of 26 mm, the coin is slightly larger than the other coins mentioned above. 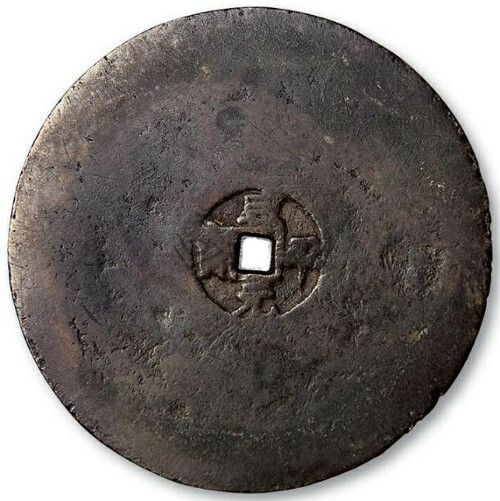 The article explains that this coin may be a “pattern” or “trial” piece (试样) or possibly a “mother” coin (铁母) used to make impressions in the moulds to cast iron coins. Li Shun ruled his Da Shu kingdom for only about five months before he was killed by the superior forces of the Song. Even without their leader, the Da Shu Rebellion continued for about another year before it was fully suppressed by the Song army in 995 AD. The ying yun yuan bao (应运元宝), ying yun tong bao (应运通宝) and ying gan tong bao (应感通宝) coins produced during the time of the Sichuan rebellion are recognized as the first coins in Chinese history to have been issued by a peasant uprising. Because the Da Shu kingdom existed just a few months, only a very small number of coins were minted. Even fewer of these coins have survived to the present time. The bronze coins are among “China’s 50 Rarest Ancient Coins” (历代古钱五十珍) which makes them, as the Chinese like to say, as rare and precious as “phoenix feathers and unicorn horns” (凤毛麟角). When emperors ruled China, the dream of Chinese parents was to have a son successfully pass the imperial examinations and be appointed to an important government position bringing honor and prosperity to the family. The charm displayed below is representative of the Chinese charms expressing such a wish. This bronze charm has finely sculptured characters and a broad rim. Both the obverse and reverse sides are displayed together in the single image. The Chinese inscription reads zhi lan yu shu (芝蘭玉樹). Zhi lan (芝蘭) translates as “irises and orchids” but has the implied meaning of “noble character”. Yu shu (玉樹) translates as a “tree made of jade” but the expression is used to describe a handsome or talented young man. “Jade tree” also has the meaning of a “scholar tree” and is a laudatory title for sons. The charm’s inscription therefore translates as a talented young man of noble character or a child with outstanding future prospects. Such an individual would be expected to do well in the imperial examinations. The reverse side of the charm has what appears to be a random collection of objects. On the left side is a lotus (he 荷). Below the square hole at about the five o’clock position is a round box (he 盒) also known as a “treasure box” (bao he 宝盒). To understand the hidden meaning of this specific assembly of objects, one must understand that the Chinese love a visual pun also known as a rebus. The “lotus” (he 荷) has the same pronunciation as “harmony” (he 和). The Chinese word for “box” (he 盒) has the same pronunciation as “union” (he 合). The “ruyi sceptre” (如意) has the same pronunciation as “as you wish” (ru yi 如意). The visual pun is thus he he ru yi (荷盒如意) which has the meaning of “may you have a harmonious union with all your wishes fulfilled”. This wish is commonly used in reference to marriages. In fact, the Immortals of Peace and Harmony mentioned above are believed to bestow blessings on marriages. This charm, which has a diameter of 59.5 mm and was cast in Yunnan (云南) during the Qing dynasty (请朝 1644-1911), sold at a China Guardian Auction (中国嘉德国际拍卖有限公司) in 2015 for about $1,200 (RMB 8050). Please see the article “Cassia and Orchid Charm” for a discussion of another Qing dynasty charm with a similar content. In the summer of 1131 AD, the armies of the Southern Song (南宋) and the Jin (金朝) were encamped on opposite sides of the Yangtze River (Changjiang 长江) and engaged in a pitched battle. General Liu Guangshi (刘光世) commanded the Southern Song army while General Wan Yanchang (完颜昌) led the forces of the Jin. The two armies were of equal strength and neither side was able to advance on the other. General Liu decided to try to break the stalemate through the use of an unusual instrument of propaganda. The coins were not meant to circulate as currency, however, because they were created to achieve the specific military goal of inciting defections among the enemy ranks. The coins were made of bronze (copper), just like the common Chinese cash coins, but a few were made of silver and some of gold. At the left is the image of one of the bronze coins. The inscription, written in regular script (kai shu 楷书), is read in a clockwise rotation as zhao na xin bao (招纳信宝). The coin inscription zhao na xin bao (招纳信宝) is explained as follows. Zhao (招) means “to beckon” or “recruit”. Na (纳) translates as “to admit” or “to accept”. Xin (信) is a “letter”. 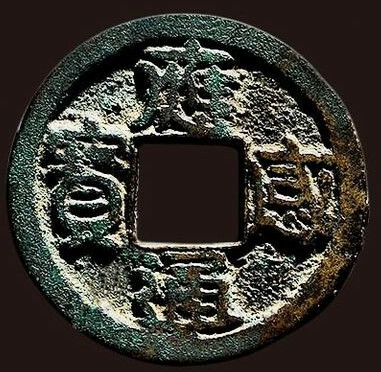 Bao (宝) is a “treasure” which is the term that was used on Chinese cash coins (coins with a square hole in the middle) for two thousand years. This rare coin is in the collection of the Hangzhou Museum (杭州博物馆). 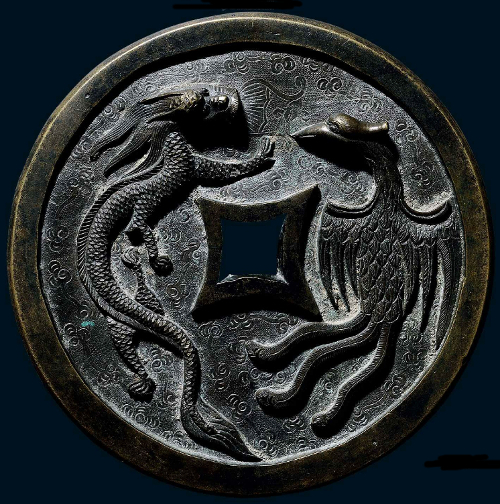 The coin was donated to the museum in 2006 by the family of Mr. Ma Dingxiang (马定祥) who was one of the most respected Chinese numismatists of the 20th century. 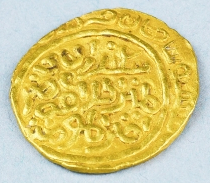 The coin has a diameter of 2.6 cm and a weight of 5 grams. 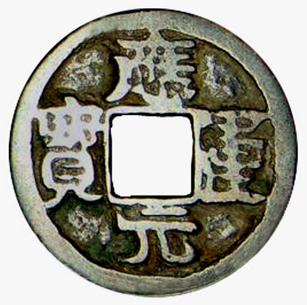 One of the easily observed characteristics of these coins is that the bao (宝) character, at the left of the square hole, is unusually “tall”. According to this article, the National Museum of China (中国国家博物馆) also has a bronze zhao na xin bao coin in its collection. General Liu knew that many of the soldiers in the Jin army were ethnic Han Chinese (汉族), and not Jurchen (女真族), and that they had been forced to serve in the Jin military. He felt that many of these men were probably homesick and would like to escape and return to their homes. General Liu implemented a new policy with the casting of the coins. When Jin soldiers were captured, instead of being killed, they were treated very well. The captured Jin soldiers were shown the newly minted coins and told that anyone carrying one of these special coins could return safely to their home. The captured Jin soldiers were then given the coins and told to return to the Jin army and give the coins to any of their compatriots who wished to desert and return home. The soldiers returned to the Jin encampment and secretly distributed the coins to the other soldiers who wanted to leave. 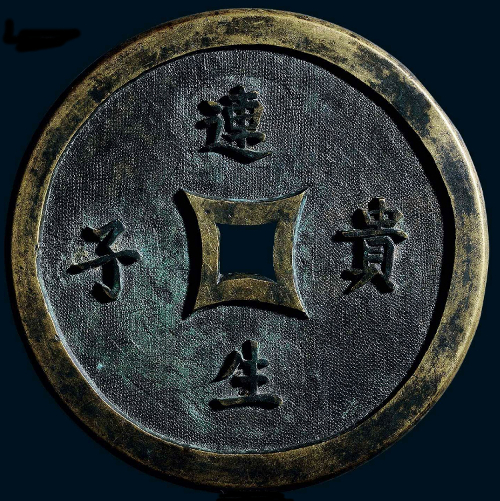 The inscription zhao na xin bao (招纳信宝) therefore means it is a “treasure” or coin (bao 宝) that is “recruiting” (zhao 招) soldiers of the Jin who want to return home. They will be warmly “accepted” (na 纳) into the Song army encampment and the coin would serve as their “letter (xin 信) of introduction”. Mr. Ding Fubao (丁福保) points out in his authoritative “Dictionary of Ancient [Chinese] Coins” (古钱大辞典) that zhao na (招纳) has the meaning of “submitting to the authority of another” (gui fu 归附). The inscription could therefore be interpreted to mean that the bearer of the coin can trust that he will be able to safely return to the authority of the Song. Noted Chinese numismatists have proposed English translations of the coin inscription as “Trust Token for Recruits” and “Pass Coins“. The reverse side of the coin, seen in the rubbings at the left, show the Chinese character shi (使) above the square hole. “Shi” (使) means “a messenger” or “envoy” which implies that the coin and bearer are on an official mission. Below the square hole is a symbol that resembles the Chinese character shang (上) although it is reversed left to right and thus facing the wrong direction. The consensus of Chinese numismatists is that this is actually a “signature”, and possibly that of Liu (刘), although the exact translation has yet to be determined. As mentioned above, some of these coins were also cast in silver and gold. Several Chinese coin references mention that in the past a few specimens of these coins were in the hands of private collectors. Unfortunately, the current location of these coins is unknown. However, a Chinese reference (中华珍泉追踪录) provides some information regarding the silver version of the coin. During the Republican period (1912-1949), Mr. Fang Dishan (方地山) had a silver specimen in his collection. 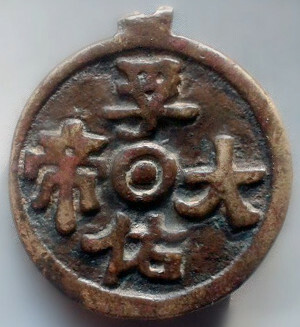 Mr. Yuan Hanyun (袁寒云) described this coin as being slightly larger than the bronze version. The shi (使) character above the square hole on the reverse side was slightly smaller. 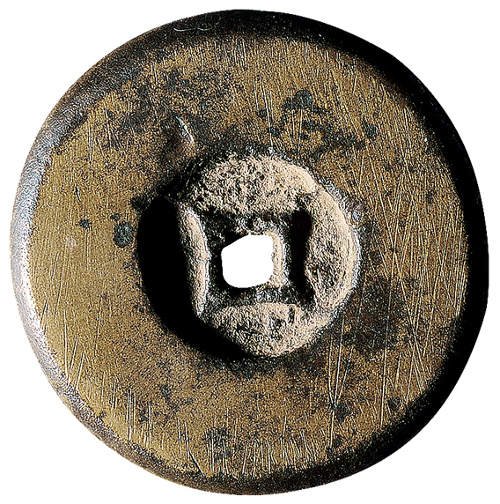 Most noteworthy, however, was that the character below the hole was not a “reverse” shang (上) like that on the bronze coin. The character resembled a 凵 (kan) with a 禾 (he) in the middle. This apparently was a signature but, again, the meaning is unclear. Mr. Fang Dishan passed away in 1936 and it is not known what happened to his silver coin. Regarding the gold version of the coin, the Baidu Encyclopedia reports that Mr. Chen Rentao (陈仁涛) owned a specimen. Mr. Chen passed away in 1968 and I have not been able to determine the whereabouts of this coin which is considered “priceless” and a “first-class cultural relic” (一级文物). According to historical records, the coins achieved their goal as an instrument of psychological warfare. These coins guaranteeing freedom persuaded tens of thousands of Jin conscripts to defect to the Song. Some of the men decided not to return home but instead to join the fight on the side of the Song. The recruits were organized into two new armies, namely the “Red Hearts” (chi xin 赤心) and the “Army Appearing from Nowhere” (qi bing 奇兵). The flood of deserters, which included not only Han Chinese but also Jurchen and Khitan (契丹), was so great that General Wan and the Jin army were forced to retreat. Because the coins were issued over a very short period of time and circulated in a very limited area, very few authentic specimens have survived. These coins are quite rare and valuable. An authentic bronze zhao na xin bao coin would sell today for about 100,000 RMB ($14,500). As mentioned earlier, the silver and gold coins are so rare that they are essentially priceless. Unfortunately, most of the zhao na xin bao coins seen today are fakes or reproductions. 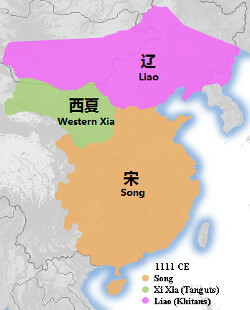 The Western Xia (Xi Xia 西夏 1038-1227) was an empire situated between the Song (宋朝) and the Liao (辽朝). Until very recently, Chinese numismatists were aware that the coins of the Western Xia had inscriptions written in the native Tangut script (xi xia wen 西夏文) or one of the calligraphic styles of Chinese with the notable exception of Seal script. It was therefore considered a major discovery in 1984 when a cache of coins was unearthed in Ningxia (宁夏) that included a Western Xia coin written in Seal script (纂书). The coin was a guang ding yuan bao (光定元宝) cast during the reign (1211-1223) of Emperor Shenzong (李遵頊). This coin has a diameter of 25.3 mm, a thickness of 1.4 mm and a weight of 4.3 grams. A second specimen was unearthed in 2002 in Shaanxi (陕西省), and then a third specimen was dug up in Inner Mongolia (内蒙古自治区). With additional excavations in the area of Tongxin County (同心县) in Ningxia, there are now more than 10 authentic specimens of guang ding yuan bao written in Seal script known to exist. It was believed that these guang ding yuan bao coins cast towards the very end of the dynasty were the only Western Xia coins produced with a Seal script inscription. In 2012, however, a farmer digging in a field in Tongxin County, Ningxia uncovered a cache of Western Xia coins that included a different coin written in Seal script. The inscription was qian you yuan bao (乾祐元宝) which indicates that the coin was cast during the reign (1170 – 1193) of Emperor Renzong (李仁孝). Coin catalogues through the centuries had documented this coin being cast in Regular or Running scripts but not in Seal script. This newly discovered coin, shown at the left, is the only qian you yuan bao written in Seal script known to exist according to an article written by Dr. Zhu Hu (朱浒) of the Art Research Institute of East China Normal University (华东师范大学艺术研究所) published earlier this year in “China Numismatics” (2016年1期). The inscription (乾祐元宝) written in Seal script is read in a clockwise rotation starting at the top. The coin has a diameter of 25.4 mm, a thickness of 1.5 mm and a weight of 3.3 grams. The inscription can be seen in greater detail in the rubbing of the coin shown at the left. The Seal script you (祐) character, at the right of the square hole, is in the same style as the you found on inscriptions from coins cast during the Northern Song dynasty (北宋 960-1126) such as jing you yuan bao (景祐元宝 1034-1038), jia you yuan bao (嘉祐元宝 1056-1063), and yuan you tong bao (元祐通宝 1086-1093). The Seal script yuan (元) character, located below the square hole, is very similar to the yuan found on the Northern Song xuan he yuan bao (宣和元宝 1119-1125) coins. The Seal script bao (宝) character, to the left of the square hole, mimics the bao found on the Northern Song zheng he tong bao (政和通宝 1111-1117) and xuan he yuan bao (宣和元宝 1119-1125) coins. It is clear that the Seal script inscription on the newly discovered qian you yuan bao was greatly influenced by the style of the Northern Song coins. As mentioned above, the qian you yuan bao was the second type of Western Xia coinage found to have been cast in Seal script in addition to the more common Regular and Running script varieties. A few differences can be seen in comparing these two Seal script coins. An image of an authentic guang ding yuan bao in Seal script may be seen at this Chinese website, but for our purposes we can look at the rubbing at the left. The yuan (元) character of the guang ding yuan bao has more “twists and turns” while that of the qian you yuan bao is more “dignified”. Also, the last stroke of the yuan character of the guang ding yuan bao touches the rim which is not the case with the yuan on the qian you yuan bao. The “crown” of the bao (宝) character of the guang ding yuan bao is more “square” while that of the qian you yuan bao is more “round”. These characteristics are also found on the Seal script coins of the Song. Dr. Zhu advances a theory as to why Seal script inscriptions only appeared on Western Xia coins toward the end of the dynasty. When the dynasty was established in 1038, the Tangut people (党项族) discarded the Chinese written language and rejected Chinese clothing in an effort to restore their original national character. They created their own writing system known as Tangut and the first coins had inscriptions written only in Tangut. By the time of Emperor Ren Zong’s Qian You reign (1139 – 1193), however, there was political stability, economic prosperity, and less warfare. The Emperor attached importance to education and the establishment of schools including an Imperial Academy. He established an imperial examination system similar to that of the Chinese. There was also greater respect for Confucianism and the culture of the Song. This period was considered to be the heyday of Western Xia rule. The first Western Xia coinage had inscriptions only in Tangut but the Song dynasty custom of casting “Matched Coins” (dui qian 对钱), where two or more different calligraphy styles were used on coins of the same period title, continued during the Western Xia. These styles included Official script (Li Shu 隶书), Regular script (Zhen Shu 真书), Running script (Xing Shu 行书), and Grass script (Cao Shu 草书). With the recent discoveries of the qian you yuan bao and guang ding yuan bao coins, the Seal script (Zhuan Shu 纂书) has now been added to the calligraphic styles used to form the “Matched Coins” of the Western Xia. Discovery of a new Chinese coin variety is a rare occurrence nowadays so the Seal script qian you yuan bao caused great excitement among collectors. The discovery also means that the qian you yuan bao is the only Western Xia coin known to exist in three calligraphic varieties, namely Regular, Running and Seal scripts. The fact that this coin is very well-made and, to date, is one of a kind, lends credence to the belief that the coin may be a trial piece and that very few were actually cast for circulation. The Cultural Relics Bureau of Jinshi City (湖南省津市市文物局), located in Hunan Province (湖南省), is offering a reward of $1,500 (RMB 10,000) to anyone who can decipher the inscription on some ancient gold coins in the city’s museum, according to an article published February 16, 2016 in the Beijing Daily (北京日报). The six gold coins, which are classified as first-level national cultural relics (国家一级文物), were discovered during the 1960s buried in a small white glazed pot at a farm in Jinshi (津市). The coins were moved to Jinshi City’s museum in the 1980s. According to Mr. Peng Jia (彭佳), Director of the Cultural Relics Bureau of Jinshi City, the coins are hammered in a manner similar to that used by the ancient Greeks. In 2001, it was determined that the coins were minted by the Delhi Sultanate (德里苏丹国 1206-1526) in northern India around the time of China’s Yuan dynasty (元朝 1271-1368). According to Mr. Peng, the inscription on the obverse side of the coins is the name of a king written in a rare form of Arabic. The museum staff, as well as other Chinese and foreign experts, have been unable to decipher the inscription on the reverse side of the coins which is shown in the image above. By offering the reward, it is hoped that the mystery surrounding the coins can be solved. During the reign (998-1022) of Emperor Zhenzong (真宗) of the Northern Song dynasty (北宋), a small quantity of cash coins were minted that had very broad rims and/or were very thick. Chinese coin collectors refer to these coins as bing qian (饼钱) which translates as “biscuit” coins or “cake” coins. This was not the first time such biscuit money had been produced. Wang Mang (王莽) of the Xin dynasty (新朝) during his reign (7-23) also cast huo quan (货泉) coins that were very thick and heavy. However, this earlier cake money did not have the very broad rims that distinguish the Song dynasty biscuit coins. Emperor Zhenzong of the Song issued regular cash coins under four different reign periods: xian ping (咸平 998-1003), jing de (景德 1004-1007), da zhong xiang fu (大中祥符 1008-1016) and tian xi (天禧 1017-1021). 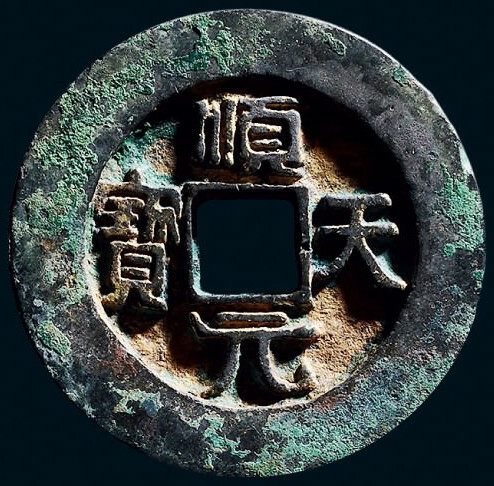 However, only during the xian ping and xiang fu regnal periods were biscuit coins produced having the inscriptions xian ping yuan bao (咸平元宝) and xiang fu yuan bao (祥符元宝), respectively. No authentic biscuit coins with the inscriptions jing de yuan bao (景德元宝) or tian xi tong bao (天禧通宝) are known to exist. Shown above is an outstanding example of a xian ping yuan bao biscuit coin. The coin is large and heavy and has an extremely broad rim which slopes downward near the edge. The reverse side, shown below, also has a very wide rim. You will also notice that the corners of the square hole on the reverse side extend outwards towards the rim. This is known as si jue (四诀) and is only found on certain Song dynasty coins. Common xian ping yuan bao cash coins have diameters of 2.14 – 2.6 mm and weigh 2.2 – 5.8 grams. In contrast, this specimen has a diameter of 46.7 mm and weighs 73.2 grams. The coin sold at auction in 2013 for US$2,623 (RMB 17,250). The reason why these broad-rimmed and heavy coins were produced is still unknown. Mr. Sun Zhonghui (孙仲汇), a well-known Chinese numismatist, wrote in 古錢幣圖解 (gu qian bi tu jie) that these coins were definitely cast during the Song dynasty. The coins are not standardized and their size and weight varies. He states that further research is needed to determine what their value was at the time and whether or not they actually circulated as currency. Mr. Sun further states that many of these coins have been found in Sichuan (四川). 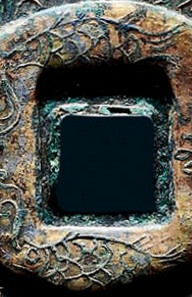 During the Song dynasty, the government expropriated copper items and copper (bronze) cash coins resulting in a copper shortage in the province. The coins that circulated were made of iron. Because of the copper shortage, the purchasing power of the iron coins fell drastically while that of the copper coins soared. Because large and heavy copper coins like these biscuit coins would have had real value, Mr. Sun feels the probability is very good that these coins circulated as currency. Shown below is perhaps the most famous of the Song dynasty biscuit coins. The coin has a diameter measuring 66 mm but, unfortunately, the weight is not specified. Nevertheless, it is the largest Song dynasty biscuit coin known to exist and the only specimen of its kind. This coin was listed at an auction in 2008 with an estimated price of $9,124 – $15,207 (RMB 60,000 – 100,000). Regarding Song dynasty biscuit coins, there are far fewer xiang fu yuan bao (祥符元宝) known to exist than xian ping yuan bao. An example of a xiang fu yuan bao biscuit coin with a diameter of 26.4 mm was listed at this auction in Shanghai in 2014. This beautifully engraved and gilded shun tian yuan bao (顺天元寶) charm dating from the Tang Dynasty (唐朝) appeared at an auction in China in 2015. Shun tian yuan bao coins were issued during the years 759-761 by Shi Siming (史思明), a rebel leader who seized control of the Tang dynasty capital of Luoyang (洛阳). Luoyang was a major center of Buddhism (中国佛教) in ancient China. Shun tian (顺天) refers to the Shi Siming’s era name. 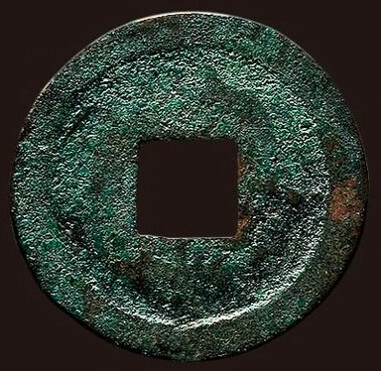 The shun tian yuan bao was the first coin to use the term yuan bao (元寶) meaning “original currency”. 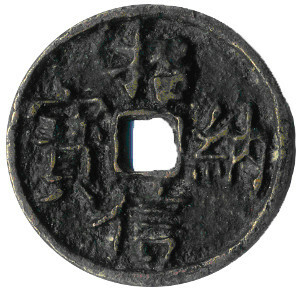 The character bao (寶), at the left of the square hole, is written in the same style as used on the kai yuan tong bao (開元通寶) coins of the Tang dynasty. The yuan (元) character, below the square hole, has a left shoulder similar to the majority of kai yuan tong bao coins. The obverse side, shown above, is the same as a standard shun tian yuan bao coin. The only difference is that this coin is slightly larger. The diameter is 39.7 mm while most of the coins are 36.5 – 37.5 mm. Because of its size, this coin may have been an early issue. Shown below is the reverse side. 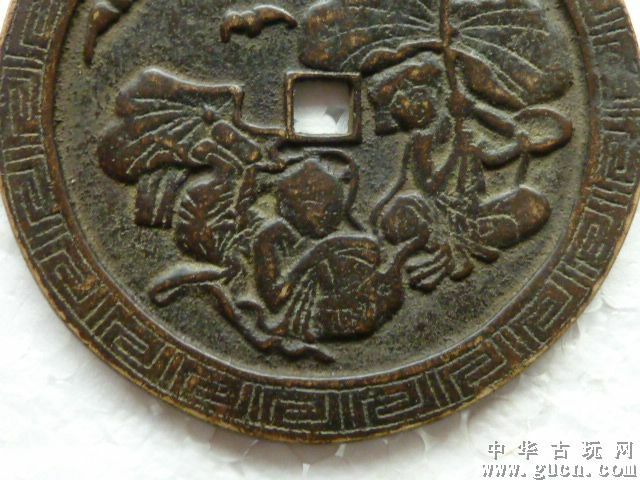 As can be clearly seen, the reverse side of this coin has been embellished and gilded (鎏金). The broad rim has been engraved with a wave-like pattern and the area surrounding the center hole has four symbols making the coin into a charm. The description in the auction catalogue describes the charm as being exquisitely engraved with waves and “auspicious cloud” symbols, and that it was probably an offering to a Buddhist temple during the Tang dynasty. However, upon careful examination it can be seen that the so-called “auspicious clouds” (祥云) are in fact something quite different. I have rotated the coin so that the symbols can be viewed more easily. Shown at the left is the symbol at the right of the hole. The symbol is actually that of a bat with its wings spread. The bat is considered an auspicious symbol to the Chinese because its pronunciation fu (蝠) is the same as the pronunciation of the Chinese word fu (福) which means “good fortune” or “happiness”. The bat symbol is therefore a “visual pun” or rebus for “good fortune”. Rotating the charm 180 degrees, the symbols above and below the square hole can more easily be identified. As can be clearly seen, there is a fish above and a fish below the square hole. The fish symbol is frequently seen on Chinese charms because it also serves as a visual pun. The Chinese character for fish is 鱼 which is pronounced yu. The Chinese word for “abundant” (余) is also pronounced yu. The fish symbol therefore means “more” as in “more happiness” or “more good fortune”. The depiction of two fish takes on an additional meaning. Because fish lay many eggs, its reproductive abilities is a symbol of fertility in marriage. Having many sons was particularly important to the ancient Chinese because of the importance of ancestor worship. A pair of fish (shuang yu 双鱼) can also represent happiness in marriage. The fish symbol can also be seen on other ancient Chinese coins. A fine example is this zhi bai wu zhu (“Value One Hundred Wu Zhu” 直百五铢) coin issued in 214 AD by Liu Bei (刘备) who founded the State of Shu (蜀汉) during the Three Kingdoms period (三国) AD 220-280. The final symbol on the reverse side is shown at the left. This is a lotus (lian hua 莲花 or he hua 荷花). The lotus is an important Buddhist symbol signifying purity and enlightenment. Additionally, the Chinese character 莲 (lian) for lotus has the same pronunciation as 连 (lian) meaning “continuous”. A lotus therefore also implies that good fortune and happiness should continue forever. In regard to fertility, the 莲/连 pun implies that boy babies will be born one after another. As mentioned above, the Chinese character 荷 (he) also means lotus. This character has the same pronunciation as 和 (he) meaning “harmony”. The lotus thus also has the hidden meaning of harmony in marriage. This beautifully engraved and gilded shun tian yuan bao charm sold at auction in 2015 for about $5,243 (RMB 34,500). More than fifty Chinese coins cast 2,000 years ago during the reign of Wang Mang of the Xin Dynasty were recently discovered in a tomb in Gwangju, South Korea according to Korean and Chinese news reports. The discovery is particularly notable since Korea did not begin using or casting its own coins until some 900 years later during the Koryo Period (高麗 936-1392). As can be seen in the image above, the coins have the Chinese inscription 貨泉 (huo quan; 화천 hwacheon). 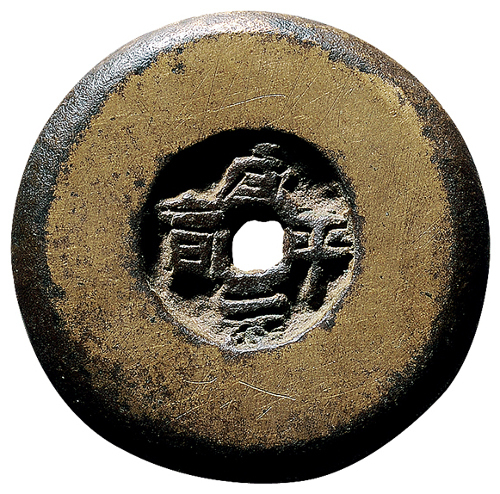 Huo quan coins were cast during the years AD 8-23 of the reign of Wang Mang of the Xin Dynasty. The bundle of coins was discovered in a rectangular togwang-myo, or earthen tomb, next to a short-necked jar and 78 pieces of blue glass-jade beads. The announcement on January 18, 2016 by the Research Center of Dolmens in Northeast Asia indicates that the tomb is located in Gwangju, Jeollanam-do Province in the southwest of South Korea. 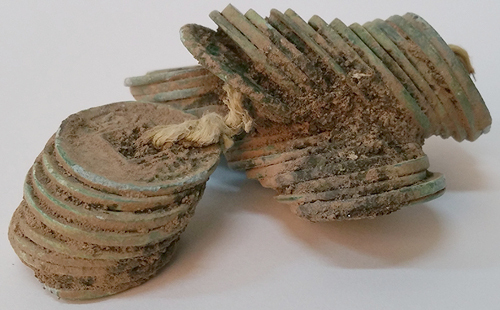 A total of nineteen huo quan coins had previously been found scattered among various ancient ruins in Korea but this is the first time that such coins had been discovered in a tomb. The book “Money, Traditional Korean Society” by Won Yu Han mentions that one of these ruins where coins from the Xin (Hsin) Dynasty had previously been found is on Jeju Island. Jeju Island is dear to my heart because I was a Peace Corps volunteer there from 1972 to 1974 working in a tuberculosis control project. Most of the coins found in the tomb have a diameter of 2.2 – 2.3 cm although some are as large as 2.6 cm. The announcement by the Research Center of Dolmens in Northeast Asia concludes that the discovery of Xin Dynasty coins around the Yeongsan River and along the southern coastal regions of South Jeolla Province is evidence that maritime trade routes with the Xin Dynasty existed at the time. Lu Dongbin (吕洞宾), a poet and scholar who lived during the Tang dynasty (唐朝 618-907), is one of the rare historical figures who attained the status of an “immortal” in popular culture. He is perhaps the best known of the Chinese “Eight Immortals” (八仙). Over the centuries, Lu Dongbin was posthumously honored with a number of titles. Emperor Wuzong of Yuan (元武宗) bestowed upon him the title “Imperial Lord of Trustworthy Protection” (fu you di jun 孚佑帝君). A popular derivation of this title can be seen on the old charm shown at the left. The inscription reads fu you da di (孚佑大帝) which translates as the “Great Emperor of Trustworthy Protection”. A circle with a dot in the middle takes the place of the square hole found in the center of most Chinese charms. The reverse side of the charm, shown at the left, has a portrait of Lu Dongbin sculpted in very high relief. In his right hand is a “fly whisk” (拂尘) which allows him to walk on clouds or fly to the heavens. Lu Dongbin was known for his drinking and fighting ability. Extending outward from his left shoulder can be seen the hilt of a sword which he carries across his back. This is his famous devil-slaying sword (宝剑) which symbolizes victory over evil. This specimen is a nice example of a Lu Dongbin charm from the Qing dynasty (清朝 1644-1912), and the bronze has acquired an attractive patina. For a further discussion of Lu Dongbin charms, please see Daoist Charms. 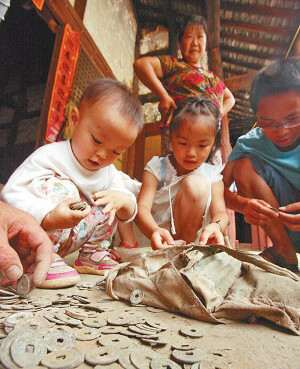 A cute photograph of several young children sorting through ancient Chinese coins accompanied a newspaper article published in the Guiyang Evening News (guiyang wanbao 贵阳晚报) dated August 12, 2015. Mr. Wang Pinli (王品礼) and his family live in a remote village in Meitan County (湄潭县) which is located in China’s southwest Guizhou Province (贵州省). 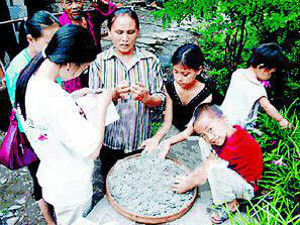 The coins, which were discovered buried on the family’s property, have become favorite toys for the children. According to the newspaper article, rats had become a nuisance. There were several rat holes in the area between the kitchen and the ox pen. Mr. Wang had filled in the hole with dirt where the rats had their nests but the rats kept returning. In 1992, Mr. Wang finally decided to dig up the rat nests and completely fill in the holes. 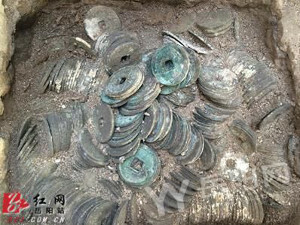 While digging, he discovered a “money pit” 1.5 meters in diameter and 2 meters in depth which was filled with ancient Chinese coins. The “money pit” included coins from the Tang, Song, Ming and Qing dynasties. There was more than 4,600 catties of coins which is equivalent to about 3 tons. Mr. Wang was able to sell the coins for 3-5 yuan (元) per catty which would be 13,800 – 23,000 RMB ($2,166 – $3,610). This money was used to take care of the elder members of the family and to send the children to school. Mr. Wang also decided to keep some of the coins. The article mentioned some of these coins as being kai yuan tong bao (开元通宝), zheng he tong bao (正和通宝), wan li tong bao (万历通宝), hong wu tong bao (洪武通宝), shun zhi tong bao (顺治通宝), kang xi tong bao (康熙通宝), and qian long tong bao (乾隆通宝). There is also mention of a coin from the Northern Wei (北魏朝) which could only be a tai he wu zhu (太和五铢). A jing yuan tong bao (景元通宝) coin minted in 1377, which was minted in Annam (Vietnam) was also discovered. Years later, Mr. Wang discovered even more coins buried on the property. This coin cache included more recent coins. Some of these coins, shown in the image at the left, can be identified. Yuan Shikai (“Fat Man Dollar”) silver dollar. These coins were minted beginning in 1914 during the Republic of China. Yuan Shikai (“Fat Man Dollar”) silver dollar. Included in this coin cache was not only Japanese coins (宽永通宝) but also a 50 cm long sword and a copy of the Book of Songs (诗经). According to a Chinese coin collector interviewed by the newspaper, the Japanese coins were cast beginning 400 years ago and circulated for about 240 years. The coins probably entered China during the late Ming and early Qing dynasties. 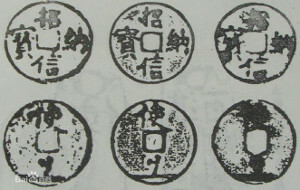 These Japanese coins are referred to as wo qian (倭钱) by the Chinese. The imperial court eventually prohibited these coins from entering the country. The Wang family lives in a very remote and relatively poor mountainous area. They are not aware of any of their ancestors who were businessmen or government officials. It is a mystery who may have owned a sword, would have been in a position to obtain Japanese cash coins, or would have studied ancient Chinese texts such as the Book of Songs. Mr. Wang can only speculate that one of the ancestors may have been a small-scale businessman who may have worked in a coastal area since that would have been the only place the Japanese coins may have circulated after the imperial court banned their entry into the county. Still, the children are just happy to play with their “toys” and are not concerned with the mystery of their origin. The children are not always careful with their “toys”, however, and the coins can be found scattered throughout the house. Another article involving a cute image of “young numismatists” (coin collectors) was published on September 15, 2015 by the major Chinese internet company Sohu, Inc. (搜狐). Ms. Wang Meiying (王美英) lives in Qianjiang District (黔江区). On August 1, 2015, she was collecting wood in the mountain area where she lives. Unexpectedly, she discovered a hole in which a large quantity of old coins were buried. The coins weighed about 30 catties which would be more than 4,000 coins. About 80% of the coins are from the Qing dynasty (1644-1911) including coins frequently found in that area such as kang xi tong bao (康熙通宝), qian long tong bao (乾隆通宝), and xian feng tong bao (咸丰通宝). Coins from earlier dynasties were found as well. Tang dynasty kai yuan tong bao (开元通宝) coins as well as Song dynasty coins such as jing de yuan bao (景德元宝) and yuan feng tong bao (元丰通宝) were discovered in the hoard. Chong zhen tong bao (崇祯通宝) coins from the Ming dynasty were also found. The reporter estimated that the coins cover a period of about 1400 years. According to Ms. Wan Jixiang (万继湘), a 75 year old local villager, this area did not use cash coins in the past and there were no landlords or government officials who lived here who could have accumulated so much money. Because this remote mountain area has a long history of banditry, some of the villagers speculate that the money may have been buried long ago by bandits (tu fei 土匪) on the run. 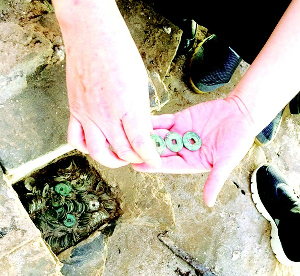 More than a thousand Tang and Song dynasty coins have been discovered during the restoration of the Cishi Pagoda (cishi ta 慈氏塔) located in Yueyang (岳阳), Hunan Province (湖南省), according to an article in the Yueyang Daily (岳阳日报) dated August 21, 2015. The Cishi Pagoda is a seven-story, eight-sided (octagonal) brick pagoda 39 meters (128 feet) in height. It was built during the period 713-714 of the Tang dynasty (618-907) which makes it the oldest surviving structure in Hunan. A major restoration took place in 1066 (宋代治平年间) during the reign of Emperor Yingzong of the Song dynasty (960-1279). The date of the original restoration was confirmed when a covered alms bowl with the inscription da song zhi ping san nian (大宋治平三年) was discovered during the current restoration. The inscription translates as “the third year of Zhi Ping of the Great Song” which would be the year 1066. As can be seen in the image above, the pagoda was in very poor shape prior to the current restoration effort which began in April of this year. The niche containing the coins can be seen at the left of the worker’s gloved hand. 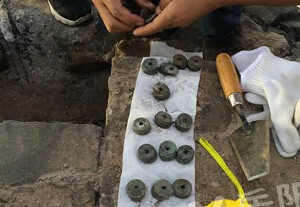 While working on the second story from the top, workers discovered a cache of more than 1,000 ancient Chinese coins hidden in a square niche. The niche is about 16 cm on a side and about 25 cm deep. The image above shows the square niche containing the coins. The image to the left clearly shows the small square niche where the coins were buried for almost 1,000 years. 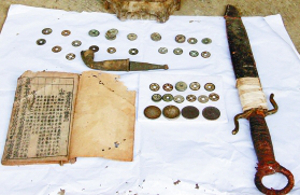 The cache includes coins dating from the Tang and Song dynasties. Most of the coins are from the early Northern Song dynasty (960-1126). According to the newspaper article, the coins include kai yuan tong bao (开元通宝) coins from the Tang dynasty. 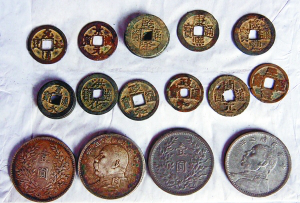 These kai yuan tong bao coins are of the variety that were being cast during the earlier years of the Tang. This is also the variety of the coin which was being minted in the period 713-714 when the pagoda was constructed. Researchers believe that these coins confirm that the pagoda was originally built during the period 713-714 of the Tang. There is an interesting legend associated with the pagoda. The pagoda is situated near the eastern shore of Dongting Lake (洞庭湖) which is fed by the Yangze River (Changjiang 长江). Being a flood basin of the Yangze, the size of the lake varies according to the season. During the Tang dynasty, the people of Yueyang were afraid of a demon that lived in the waters. The demon caused devastating floods and made the people’s lives miserable. The pagoda was built to provide protection from this demon and all the people of the village donated funds for its construction. One family in particular had suffered greatly from the water-dwelling demon. All but one member of the family had drowned in the floods. The only surviving family member was a widow. When she heard that a pagoda was to be built, she donated all of her money to the cause. Also, every day she would bring tea and water to the workers constructing the pagoda. Unfortunately, the widow died before the pagoda was completed. In memory of her sacrifice and giving, the pagoda was named Cishi which translates as “the compassionate”. 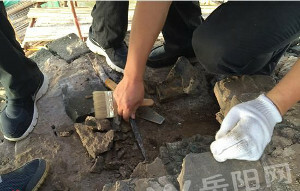 Mr. Ou Jifan (欧继凡), the Deputy-Director of the Yueyang Municipal Office of Cultural Relics (市文物管理处副主任), stated that an analysis of the coins confirmed that a major restoration of the pagoda had taken place in 1066 during the Song dynasty. Mr. Ou also explained that there was a tradition of burying coins during the construction and renovation of pagodas. Coins were believed to offer protection to the pagoda, served as a sacrifice to the heavens, and expressed the hope for peace. The restoration is scheduled to be completed by the end of 2015.